Hailsham residents turned out in their droves for a special New Year Resolution event which took place at Hailsham Parish Church and church lounge on Saturday [26th January], which showcased local community groups, clubs and voluntary organisations in the local area. The event, organised by the Hailsham Community Groups Forum, was open to everyone to attend and representatives from local community groups were on hand to answer questions about what they do and how new members and/or volunteers can benefit from joining them. There was also a ‘Volunteers’ Hub’ at which people who were unable to commit to joining any group or organisation but wish to help out occasionally, could register their interest. 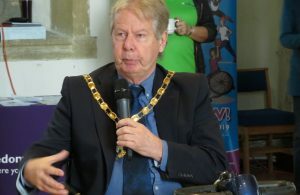 “It’s the people of Hailsham that really make our town such a wonderful place to live and work,” said Deputy Town Clerk & Business Enterprise Manager Mickey Caira. For more information about the Hailsham Community Groups Forum contact Jenny Seale on 01323 440567 or by email: j.seale1961@gmail.com.